There really is no wrong time to go to Disneyland, but there are some better times to go. Any time when lines are low and crowds are small is a good time. Mild weather compared to July heat is another good time. How about some added holiday magic? Try mid-October when Disney villains come to life during the Halloween season complete with stunning Fall decor. Combining all three--short lines, mild weather, and extreme holiday magic--are possible in early December, when Christmas magic adds a new dimension to the already impressive Disney landscape. Because of the number of guests during Thanksgiving week and the last two weeks of December (Christmas to New Years in particular), Disney takes the holiday season to new heights in their park. They have very few rides closed for refurbishment (sometimes only one or none) and an impressive number of shows even on the slower early December weeks. So what is different at Disneyland during the holidays? #1--Its a Small World--The outside is strung with thousands of lights while winter scenes are projected onto the outside building walls during certain times. 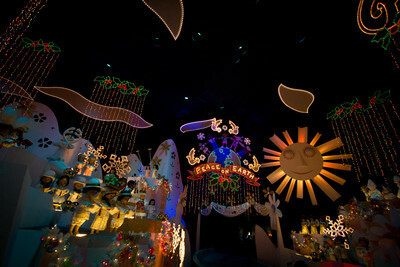 The inside has a complete renovation as native holiday decorations are added to each scene and primarily "Jingle Bells" is sung repeatedly during the ride. The outside is stunning after dark and is a must see. (Also the area outside this ride is the best place to catch the Christmas Parade). #2--Haunted Mansion becomes the Nightmare Before Christmas--for lovers of the movie, this ride will not disappoint. 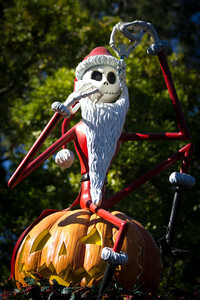 Characters from the movie also frequent New Orleans Square if you want a rare Jack Skellington autograph or photo. For those not as enthusiastic about the movie, this is still an amazing experience--a Haunted Mansion with spooky holiday decor--monster wreaths, snakes popping out of presents, holiday jack-o-lanterns piled into Christmas tree shapes. Truly an eye-popping one-of-a-kind haunted house. #3--The Christmas Parade--Disney is known for their parades and the Christmas one adds to the magic--in addition to the numerous characters and floating movie scenes are several holiday exclusives including toy soldiers, dancing snowflakes, a toy factory complete with wrapping machine, and Santa in his sleigh; (two great viewing areas are by Its a Small World or the steps of the Main Street Railroad). Also do not miss the nightly firework show (be aware that Fantasyland is closed for several hours during both parade and firework shows). As a finale, SNOW falls onto Main Street. #4--Decor, Disney Style--Main street begins with a gigantic Christmas tree (approximately 60 feet tall) fully decorated are the shops and arches. Catch Mickey and other characters wearing their Christmas sweaters or grab some Christmas mouse ears for yourself. 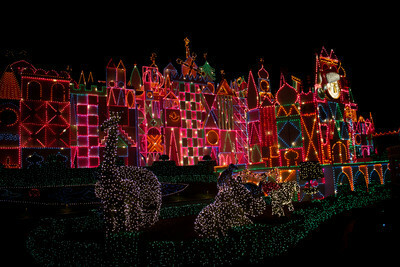 Impossible to miss is Sleeping Beauty's Castle transformed with snow capped turrets and strands of lights. #5--Santa--What would be Christmas without Santa as well as some live reindeer at Big Thunder Ranch's petting zoo. By going early in December, you may also find a few unique presents--Mickey earrings, Disney's version of Candyland, the entire Star Wars store, etc. For a truly memorable trip, Disneyland during the holiday season is unforgettable. Perhaps you should add some pixie dust to your next Christmas. I was lucky enough to go to Disney Land over 10 years ago now with my wife when they had the Christmas decorations etc and it was great. We have always said we would go back over this same period again and hope to do so next year. The whole place is just magic.